Mark Fields, 51, has long been the front-runner to replace CEO Alan Mulally, 67, who is expected to retire at the end of next year, Bloomberg reported. 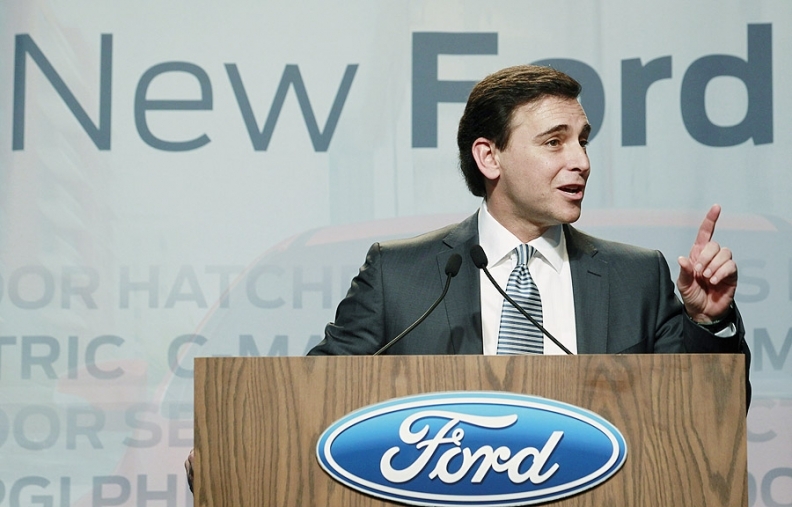 DETROIT -- Ford Motor Co. directors are preparing to promote Mark Fields to chief operating officer from president of the Americas, a move that anoints him as probable successor to CEO Alan Mulally, a person familiar with the plan told Bloomberg. Ford's board may vote this month or next to elevate Fields, 51, a 23-year veteran of the automaker who was executive vice president of Ford of Europe and also ran the automaker's European luxury brands, Jaguar, Land Rover, Aston Martin and Volvo, which Ford later sold. Fields is also credited with helping to lead a transformation of the automaker's North American operations from record losses four years ago to record profits this year. This month's board meeting is scheduled for Wednesday. The promotion would put Fields in line to replace Mulally, 67, acclaimed for saving the second-largest U.S. automaker without a federal bailout or bankruptcy. Fields has long been the front-runner to replace Mulally, who is expected to retire at the end of next year, said the person, who asked not to be identified disclosing private plans. Some Ford directors have determined Ford should go public with a succession plan to reassure shareholders and provide promotion opportunities for executives who now report to Mulally, The Wall Street Journal reported separately on Tuesday. The Journal, citing sources close to the company, reported the Ford board hasn't yet voted to approve a concrete succession plan. Ford would be required to disclose any decision immediately, the paper said, because a change in the executive suite would be considered material to the automaker's financial outlook and business. Mulally hasn't said when he will leave. But the Journal reported fellow board members don't want to push him out, but are planning for him to exit by the end of next year. A final vote approving the succession plan may occur over the next few months, people close to the company told the Journal. Fields will relinquish his role overseeing operations in North and South America, which he's run since 2005, a source said. His successor in that role is unclear, a source told Bloomberg. Asked yesterday if he would like to be Ford's next CEO, Fields dodged the question and told a group of reporters, "Thank you all for coming" at an event at a factory in Flat Rock, Michigan. Asked a similar question Jan. 10 in Detroit, Fields responded: "I am very focused on the job that I'm doing now. My ambition is to contribute as profitably as I can to the profitable growth of Ford and that means doing my job." Since then, Ford's North American operations have delivered record profits while the automaker has lost money overseas. The company earned $4.14 billion in North America in 2012's first half and had an operating profit margin of 10.8 percent in an industry where a 5 percent margin is considered respectable. Hinrichs, 45, for whom Mulally has high regard, is six years younger than Fields and may still have an opportunity to be CEO eventually. Candidates to replace Fields in the Americas include his rivals in the CEO race, Joe Hinrichs, 45, chief of Ford's Asian operations, and Jim Farley, 50, the automaker's global marketing chief, the person said. Hinrichs, for whom Mulally has high regard, is six years younger than Fields and may still have an opportunity to be CEO eventually, the person said. Ford declined to comment on the moves. "We do not comment on speculation about personnel actions," Ray Day, a spokesman, said in an e-mail. "Regarding succession, Ford Motor Co. takes succession planning very seriously, and we have succession plans in place for each of our key leadership positions." In the new role, Fields would become Mulally's clear second-in-command, with global responsibilities to help turn around Ford's unprofitable European operations and grow its nascent business in Asia, the person said. Previously, Lewis Booth, who retired as Ford's CFO on April 1, was Mulally's de facto No. 2 because he had broad operational experience in Europe and Asia. Until now, Mulally has never had a COO. "This is somebody who has been in the trenches, who was there before Mulally and will be there after," said Rebecca Lindland, a Boston-based analyst for consultant IHS Automotive. "He can bridge the two worlds and continue the cultural change." In Fields' almost seven years leading Ford's largest business unit, he is seen as having matured and grown in stature, she said. Initially, he was chided in the press as a Jersey boy with an '80s hairstyle. He opened a media lunch at the New York auto show late last decade saying, "Aren't you going to ask me about my mullet?" He also showed flashes of being a street fighter. During a meeting of top executives in 2006, Fields nearly had a physical altercation with then-CFO Don Leclair, who insisted on budget cuts to Fields' "Bold Moves" ad campaign, according to "American Icon," a book by Bryce G. Hoffmann, a reporter for The Detroit News. "When you run the f--king business, you can do it," Fields responded to Leclair, Hoffman wrote. "But you don't run it. You're the CFO. So, I'll take your counsel, but that's it." Leclair then shouted, "You're going to do this," Hoffman wrote, adding: Fields leapt out of his chair screaming, "I'm tired of this bulls---!" Then-CEO Bill Ford prevented the executives from coming to blows by grabbing Fields, according to Hoffman, and shouting, "Cut it out." Asked later about the anecdote, Fields didn't deny it and said he has always felt "passionate" about the business. Fields won early praise from Mulally for going against Ford's culture of hiding bad news by becoming the first executive to admit a problem to the new boss. Shortly after arriving from Boeing Co. in September 2006, Mulally instituted a Thursday morning meeting where his top executives are required to report on their initiatives using a green, yellow and red color code to indicate progress, caution and a problem. Fields was the first to put up a red light because a balky tailgate latch had halted production of the Edge sport-utility vehicle. Mulally, frustrated no one was reporting problems even though Ford was losing $17 billion in its automotive operations that year, began applauding when Fields revealed his red light. "Great visibility, Mark," Mulally recalled saying in a 2010 interview. "Is there anything we can do to help you?" Fields later said he had trepidations about revealing the problem because in Ford's previous culture "finger pointing would have ruled the day." "When I showed that first red, there was a lot of tension in the room," Fields said in a 2010 interview. "Then Alan clapped." By being the first to own up to a problem in the weekly meeting, "he cleared the path for everybody else," said Lindland, the IHS analyst. "People get behind someone who steps up and he stepped up. He became an authentic leader." Fields will be tasked with continuing the new culture of openness after Mulally leaves. Ford has cited its desire to identify problems early as a reason for the three quick recalls of its redesigned Escape SUV since debuting in May, including one in which owners were instructed not to drive it to the dealership because of the risk of an engine fire. "It's all about how do we keep our positive relationships with our customers and our dealers and let them know real-time what the state of the situation is," Fields said in 2010. "I always find it annoying when I'm on a plane that's delayed and I never hear from the pilot. I can stomach the delay a lot more when the pilot is giving us frequent updates." 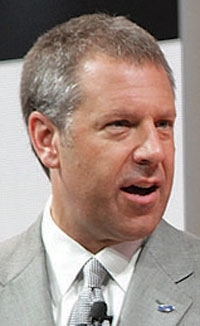 As well as gaining extensive experience in Europe and the Americas, from 2000 to 2002, Fields was CEO of Mazda Motor Corp., in which Ford had a controlling stake at the time. He led a turnaround at Mazda with several Ford executives with whom he later worked closely to revive Ford's North American business. Ford lost $30.1 billion from 2006 through 2008 and earned $29.5 billion in the last three years, mostly in Fields' North American operations.